Chio's School Road (ちおちゃんの通学路 Chio-chan no Tsūgakuro, lit. Chio's Commute to School) is a Japanese mangaseries written and illustrated by Tadataka Kawasaki. 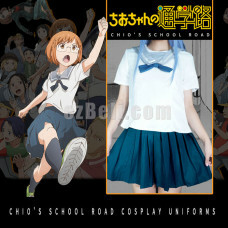 Included: Top, skirt Material/Fabric : Uniform Fabric, polyester Note: All dimensio..